03-Jun-2011 -- Second of two South Carolina degree confluences my family and I visited on our drive west after visiting friends the day before in Myrtle Beach. This confluence, along with it's neighbor 34N 79W are both easily accessible and similar in many ways that I will describe below. It took us about an hour and a half to drive the 57.273 miles (as the crow flies) west from 34 N 79 W. Our drive alternated between quiet back country paved roads and dirt roads like the one leading up to this confluence. This is actually my second time visiting this degree confluence. It has a special place in my heart as it is the first confluence I ever visited. It was a spur of the moment decision as we were driving south on I-95 back in March. Unfortunately, that visit was incomplete since I was here in the middle of the night (2 AM)! I will have to admit that being here in the day was definitely more enjoyable, although not nearly as exciting. This confluence is very close to I-95 south but driving here takes considerably longer since there is no exit close by. We found easy parking along the road at a spot where tractors apparently access this field. 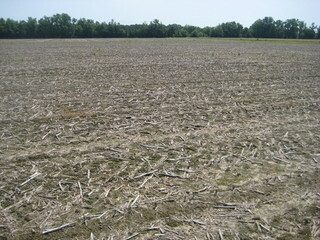 There were remnants of corn plants, harvested last year still in the field. However, there were no crops growing in the field. Strange, considering there was a field full of beautiful knee high corn across the street. I walked a few hundred feet into the field from where I parked and walked around in circles until my GPSr read all zeroes. I took a few photos and posed for an obligatory confluence phoon. Like 34 N 79 W this confluence is located along a quiet country dirt road. There is also a small single story house visible to the east. We didn't notice any activity around the house today. Also, not a single car passed during the 10 or 15 minutes we were here. 2 degree confluences in one morning... it doesn't get any better than that!